Café Pista owner, Maxime Richard was happy with his experience with POTLOC and he recommends it to all entrepreneurs who are currently looking for the perfect location to set up shop. Are you looking for a clever tool to help you find the perfect location for your future business? Potloc is here to help! Potloc is a young company that specializes in market studies. It aims to create ties between entrepreneurs who want to start their own businesses and residents who want to have a say in which stores they want in their neighbourhood. Café Pista owner, Maxime Richard was able to use this market study, which is based on participatory democracy. "Café Pista (in French only) originated from a great idea: using a bicycle to offer street food service! With the food truck craze in recent years, we were certain that there would be demand for our delivery tricycle, which has a unique machine because we use our own energy to pedal and grind coffee. But we still had to bring our food bike to parks and events to really make an impression!" "That's where Potloc (in French only) came to our rescue; they helped us learn about the consumer habits of residents who live in the neighbourhoods of Little Italy and Rosemont-La Petite-Patrie. We got a head start: Potloc assessed the demand for our coffee cart and told us where our service would be the most successful," said the entrepreneur who, to date, owns a coffee bike, two mobile espresso bars and a coffee shop on rue Beaubien in Montreal. Maxime was happy with his experience with Potloc and he recommends it to all entrepreneurs who are currently looking for the perfect location to set up shop. "In the entrepreneurial world, there's a saying that "customers always have the final say" because they're the ones who decide whether to buy your products and use your services. But why can't they have the first say? Why don't we consult the neighbourhood residents in the first place before we invest in equipment or renovations?" If residents voice their opinions--by voting or taking surveys--about the stores they want to have in their neighbourhoods, merchants can open their businesses in an area where there is demand and owners of empty buildings will be able to rent under long-term leases. It's win-win! Plus, when people want the service, it makes things easier! "We saw this with Café Pista. Customers are familiar with our business--even before it was officially launched! It's important to establish the first contact!" said Maxime. Potloc is currently consulting Lévis residents through its website (in French only) to determine which stores they want in their neighbourhood. 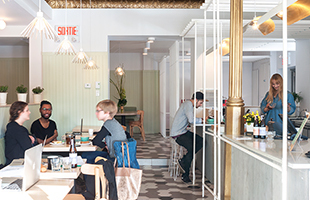 Entrepreneurs, take note: Joliette, Sherbrooke and a number of boroughs in Montreal just signed market study agreements with Potloc in order to give their neighbourhoods a boost.